We have lost a beloved family pet tortoise who has lived with us for more than 40 years. She layed her eggs at the end of July and went missing on the same day. We were hoping that she had buried herself in the garden for a rest, but has not reappeared. If she managed to get out of garden, we are situated near The Bold Forester Pub, Marchwood. Any local dog walkers/riders etc please keep a look out for her - she could quite easily have walked to the Longdown area. 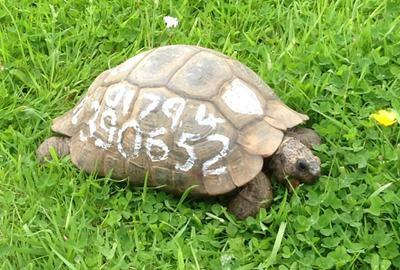 She is a large tortoise and has telephone number painted on her shell. Anyone on Facebook/twitter please share. Her name is Marmalade! Please ring with any info 07469196287. I do hope Marmalade turns up soon -poor thing. I've posted on @NewForestpiglet and @NewForestLife1 for wider coverage and if I hear anything will let you know.